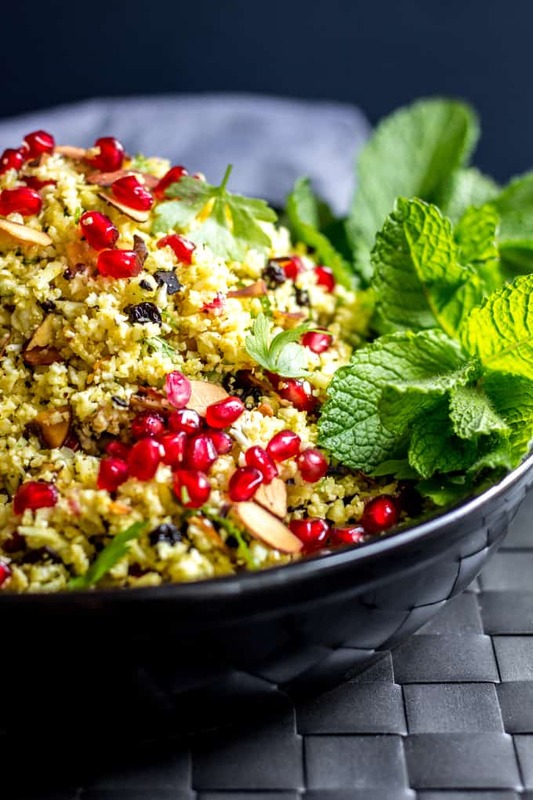 This grain-free cauliflower ‘couscous’ salad is flavored with Persian spices, jeweled with dried currants and ruby red beads of pomegranate, and lightened up with lemon, fresh mint and parsley. A beautiful and flavorful vegan, paleo and gluten free addition to any holiday, or non-holiday, table! Today we’re featuring our final guest blogger (for now!) in this series of guest posts that started in October. I’m thrilled to bring you Amber from Quite Good Food, all the way from New Zealand! If you missed any of the vegan and gluten free recipes from our talented guest bloggers, be sure to check them out below. Thanks again to all you amazing bloggers for contributing! Latke Nachos: Hanukkah Potato Pancakes With a Twist! I’m excited to have Amber today sharing with you about her Christmas in New Zealand, where it’s SUMMER! If you’re still looking for a last-minute Christmas recipe, be sure to check out this recipe below, or bookmark it for later. I hope all of you have a Merry Christmas, and now – here is Amber! Kia ora from New Zealand! Is it just me or does time actually speed up at this time of the year? As usual I’m in a whirlwind of wrapping up work for the year, Christmas shopping and planning my summer holiday. Yes, that’s right, my summer holiday. Christmas looks a bit different for us in the southern hemisphere, with most Kiwis headed to holiday houses and camping grounds, national parks and beaches. Christmas dinner with sand between your toes is entirely commonplace. For my family, Christmas day starts at home with an early wake up and much excitement from my girls, eager to see what Santa has delivered. We then move on to a light but lovely breakfast, generally a huge fruit platter with melon and lots of summer berries (I’m wise to the food onslaught coming later that day!). My extended family will gather by late morning, often at Mum and Dad’s, to settle in for a long, relaxed day of eating and drinking. We’ll be well dressed but in bare feet, there’ll be a mountain of gifts under the tree, multiple chilly bins (coolers) packed with wine and beer, sun umbrellas out and tables groaning with lovingly prepared food. Traditionally Dad gets up early on Christmas Day to dig new potatoes from the garden, then sits on the back porch cleaning them (and avoiding the madness in the kitchen). We’ll graze on platters of nibbles before Christmas dinner is served around 2pm in the afternoon. The focal point of that meal will inevitably be ham and turkey for the rest of the family, but there’ll also be those lovely new potatoes, and four or five different salads. Ahem, and dessert. So much dessert. Some years I’ll make a nut roast or other vegan main dish, though honestly I’m pretty happy with the salads. I do always try to come up with something creative to contribute. Something that I’ll love, and something that others will equally appreciate as a side dish. 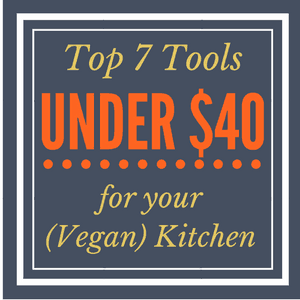 If it’s a little bit special and includes unusual or extravagant ingredients, all the better! Christmas only comes once a year, after all. This year I’m feeling inspired by the bold colours and fragrant spices of Persian cuisine. I had a lot of fun creating this vegan and gluten free cauliflower ‘couscous’ salad which is flavoured with a selection of Persian spices, jewelled with dried currants and ruby red beads of pomegranate, and lightened up with lemon and plenty of fresh mint and parsley. Toasted almonds provide a welcome crunch and balance the flavours. I’m no expert on Persian food, but I do know this salad is a feast for the senses. The combination of spices used here is mellow, sweet and fragrant, dominated by the heady scent of cardamom. Nothing compares to fresh cardamom so I’d recommend buying whole green cardamom pods and grinding the seeds fresh for this recipe. You’ll need the seeds from 8-10 pods. This is not a traditional dressing – it’s a potent brew that will become subtle once diluted by the rest of the salad ingredients, so don’t worry if it seems unusual or too heavily flavoured. All will be well in the end, and this Persian inspired salad will be right at home as part of a Christmas feast. Amber Bremner is the author of popular plant based food blog Quite Good Food. 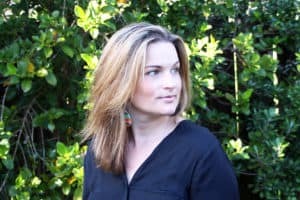 A keen traveller, Amber’s adventures often bring new tastes back home to her family kitchen in Hamilton, New Zealand, where she develops recipes that make her feel good, that are good for the world, and most of all taste fantastic. Follow her on Pinterest, Facebook and Instagram. 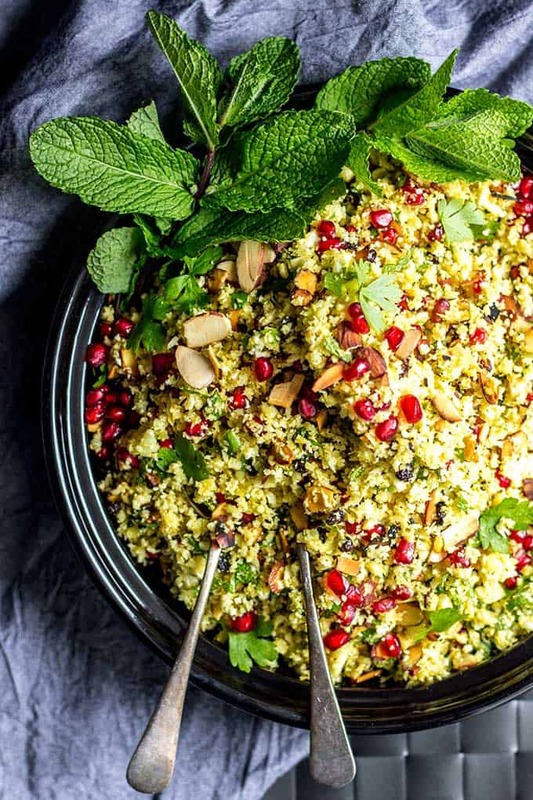 This grain-free cauliflower 'couscous' salad is flavored with Persian spices, jeweled with dried currants and ruby red beads of pomegranate, and lightened up with lemon, fresh mint and parsley. A beautiful and flavorful vegan, paleo and gluten free addition to any holiday, or non-holiday, table! Start by making the dressing. Add everything except for the olive oil into a small saucepan and stir to combine. Swirl over a low heat until the mixture is fragrant and the first bubbles are appearing. Turn off the heat and set aside to cool. Once cool, tip this mixture into a small jar, add the olive oil and shake to combine. Toast the flaked almonds by stirring them in a hot, dry skillet until golden brown. Tip onto a plate and set aside to cool. Create cauliflower couscous by chopping the cauliflower into florets (you don't want too much stalk). In two batches, put the florets into a food processor and pulse until the cauliflower is a couscous-like texture. Tip into a large mixing bowl and repeat with the rest of the cauliflower florets. Pour the dressing over the cauliflower couscous and stir to combine. Once evenly mixed the couscous will be an even pale yellow colour. Add the pomegranate arils (reserve some for garnish), toasted almonds, mint, parsley and currants to the mixing bowl with the cauliflower and stir to combine. Garnish with reserved pomegranate and extra herbs, if desired. Serves 4 as a substantial serving, but will easily serve 8-10 as a smaller side dish as part of a Christmas meal. If you're making this ahead of time: This salad will keep for a day or two in the fridge as leftovers, but if you're making it for Christmas or a special occasion then fresh is always better for the best flavour. There is prep you can do the day before to make it easy on yourself though. The day before: make the cauliflower couscous and dressing, and store in the fridge in separate airtight containers. Remove the pomegranate arils and store in the fridge in an airtight container. Toast the almonds and store in an airtight container once cool. On the day: add the toasted almonds, currants, pomegranate arils (reserve some for garnish) and freshly chopped herbs to the cauliflower just before serving. Garnish with reserved pomegranate arils and extra herbs.